Orsimer or simply orcs are often seen as barbarians due to their looks and the tribal nature. The Orcs follow the code of honor of Malacath, the Daedric Prince of curses and treachery and the patron Daedra of the Orsimer. Those who follow Malacath’s teachings put a high value on fighting. With that in mind, it’s no surprise why the Orcs are such brave warriors. 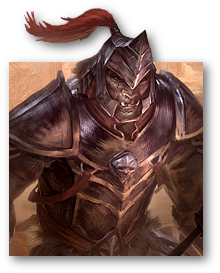 Orcs are members of the Daggerfall Covenant, an alliance of Bretons, Redguards and Orcs. The symbol of Orcs in Elder Scrolls Online is a hammer and an anvil, depicting the mastery of blacksmithing which the Orcs are renowned for. They are arguably the best smiths of all Tamriel, and Orcish armor and weapons are valued by warriors and craftsmen alike. The racial skills of Orcs have combine survivability and endurance. The Orcs gain increased experience with Heavy Armor skill line and the racial ability Brawny increases the maximum Health and Stamina of an Orc. Robust is a racial skill which increases health regeneration in combat, this racial skill is also shared with Nords and Khajiit, the sturdy warrior races of the other alliances. Lastly, the sprint cost is reduced and sprint speed increases thanks to the passive racial, Swift. The Orc racial skills seem to have a very nice balance of Health and Stamina enhancing effects. The bonuses to sprint should not be overlooked, either. Being able to run fast and for longer periods of time is a great ability to have no matter what you do. Gain XP with the Heavy Armor skill line 15% faster.